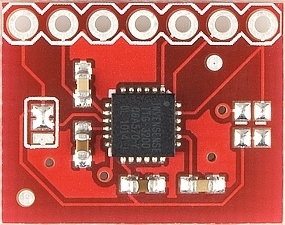 The aeroquad shield contains pins to be able to connect some sensors namely a ITG3200 BMA180 and HMC5843. 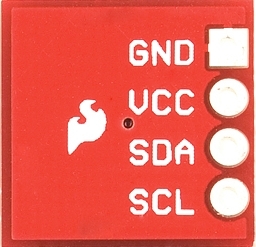 The I2C connections from the arduino are also buffered and converted to 3.3 volt by a small voltage converter. There are connections for remote control and plenty of other connection posibilities. I have a aeroquad shield version 1.8 which was only different from the version 1.9 in the voltage divider for the battery level display as you can see below. This is quite easy to correct by simply soldering three 15kOhm resistors. Two go between ground and the A0 port and one between VIN and the same port. 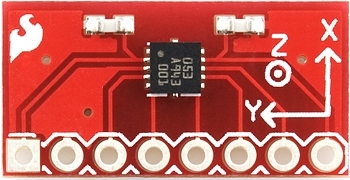 The parallel wired resistors together make up 7.5kOhm which is what the version 1.9 uses. If you have a 7.5kOhm resistor this can of course be used instead of the two. You can do some nice things with the aeroquad shield besides using it for a helicoptor design. This includes spinning a cube using the gyro and accelerometers as input. Of course you can also test the individual components and the libraries that they need to work with. It also has plenty of room for additional components to be mounted. 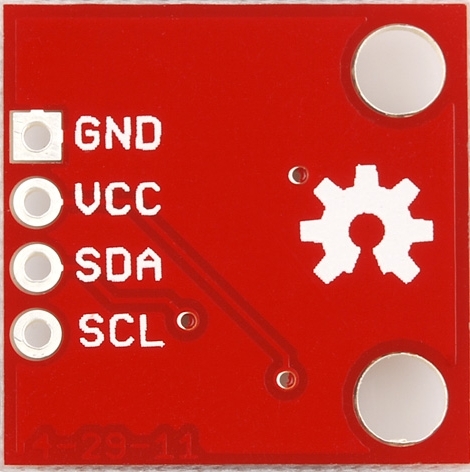 There are I2C ports to connect other sensors to the devuice and a really nice interface for the remote controllers that helicopters use. All the usual connections such as Aux, Gear, Rudd, Elev, Aile and thro are there. You also have a 5v to 3v converter so all peripherals are at the right voltage and do not get cooked.You can also add a barometer and be able to read the pressure should you uyse this device for high altitude work such as balooning. 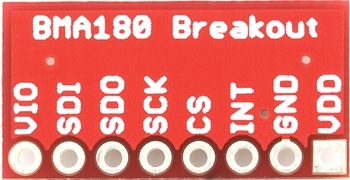 Finally there is a serial port connector for GPS location devices so you can even tell the exact position of the device. 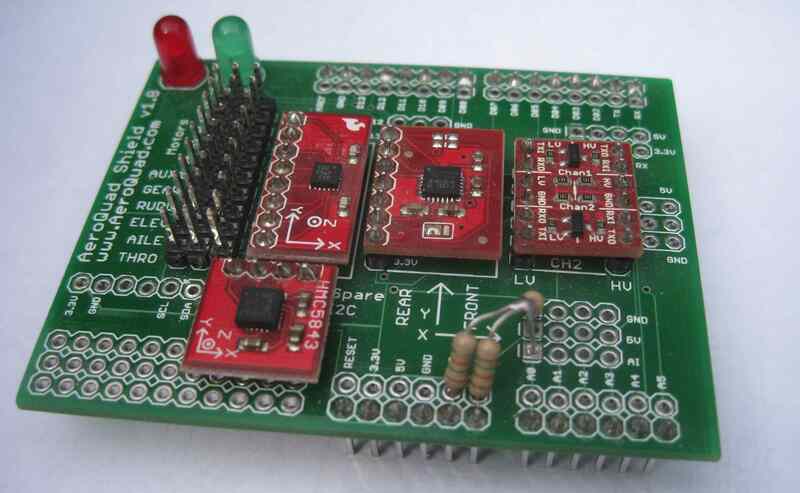 The sensors that are built into this board are as follows. 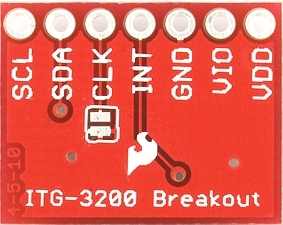 The ITG3200 3 axis gyro. 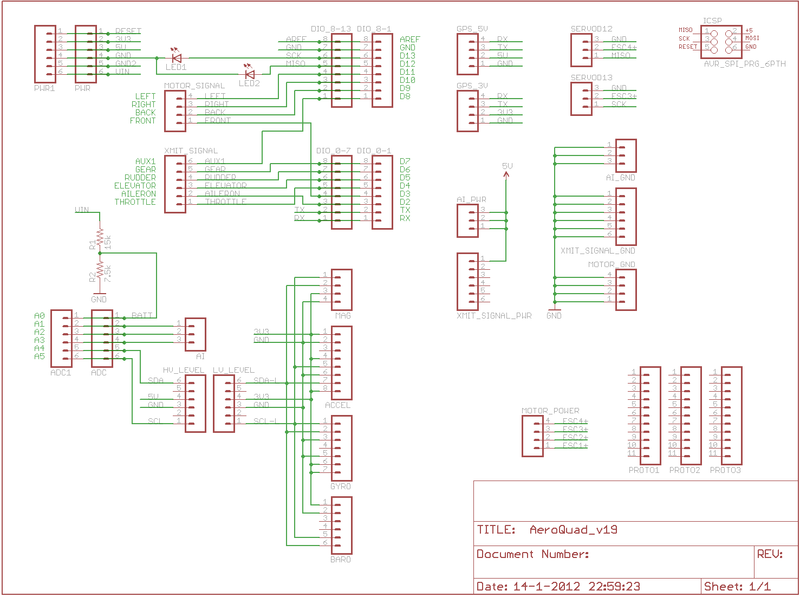 You can clearly see that the jumper connected to pin9 of the ITG3200 is connected to VDD which means the software should take the HIGH adress. There is a bit more information with some specific examples elsewhere on my site. 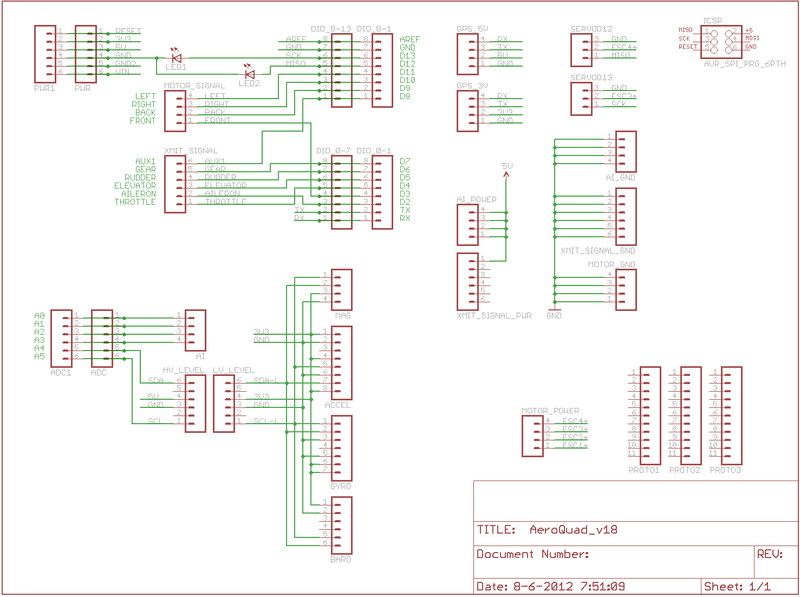 As you can see from the schematic SDO is connected to GND so that the I2C adress is the LOW one. There is a bit more information with sopme specific examples elsewhere on my site. Finally there is the HMC5843 three axis magnetometer. 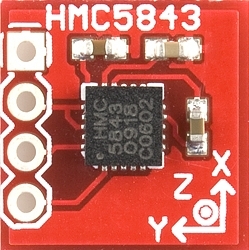 The HMC5883L is also pictured here because it is the successor of the HMC5843 with very similar functionality. Here you can see the Aeroquad shield v1.8 board with the resistors for the voltage divider for the battery level display mounted and also the position of the magnetometer. On Fabio Varesano’s http://www.varesano.net/projects/hardware/FreeIMU site there is a really cool bit of code to test this combination. It only needs a small adaptation to be able to use it with the Aeroquad shield. You can find the updated FreeIMU.h code here. published by the Free Software Foundation. along with this program. If not, see <http://www.gnu.org/licenses/>. // 3rd party boards. Please consider donating or buying a FreeIMU board to support this library development. 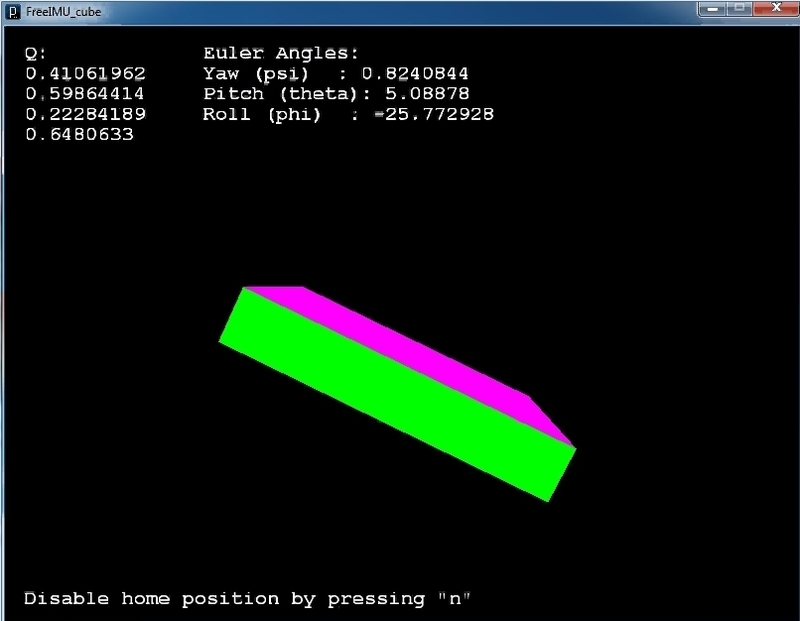 You run the FreeIMU_quaternion.pde example on the arduino and FreeIMU_cube.pde in processing. This visualises a solid object which you can move by moving the Aeroquad shield. Here is a short video of what this looks like.